Ohio or Florida? 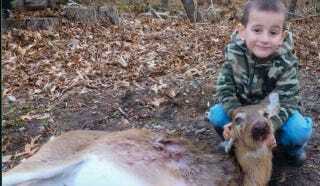 Trick question; it's Virginia, one of the few states that doesn't have a minimum age for hunting. Little James Futrell, returns after winter break having grown up faster than his pre-kindergarten classmates. He has stalked the beast, and bathed in its blood. Before the hunting season opened, Brian Futrell was letting his 10-year-old stepson, Christopher Clapp shoot a .410 shotgun that Futrell's dad got him when he was 8. "He (James) wanted to try and I told it him ‘it will kick you pretty good.'" Standing behind James, Brian Futrell watched James shoot at some targets. "He said, ‘that thing kicks, but that was fun.'" The knee-high deathdealer brought down two does over the span of a month, taking both cleanly in the side. When he killed his first, his father says James "was jumping up and down." This is what a .410 bore shotgun looks like, so James wasn't playing around with some toy gun. While not exactly top of the line, according to the essay You And The .410 Shotgun, "it's a proven fact that .410's build character."